I’ve always had this image in my head of the typical American tourist - Bermuda shorts (or sweatpants), some tacky t-shirt. Camera with a long range zoom lens permanently affixed to their brow. Maybe a map hanging from an overextended, confused palm. And it has been just that image that I’ve tried to avoid. The last time I was in Paris I made it a point to avoid just about any touristy attraction that I could. I did not stand in line to see the Mona Lisa or climb to the top of the Eiffel Tower. So I did drink mulled wine and eat a savory crepe while promenading the Christmas Market but I forced myself to not enjoy it. Needless to say this avoidance of anything that might otherwise be listed in the pages of Fodor’s meant that stepping into the Romisch-Germanische Museum directly under the shadow of Cologne’s Dom, was a wholly different experience from my normal travel occurrences. But when you have such a man as Paul Anater dragging you by the ankles you have no choice. I’d studied the arts of the Romans during my collegiate years; textbook after textbook of marble statues and jewelry and architecture. But really, and as cliché as this might sound, there really is nothing that can prepare you from seeing the arts and handiworks of the Roman artist in person. Keep in mind, the Romans occupied the fertile lands surrounding the Rhine as early as the 2nd century BC, some 2,200 years ago. And yet, their glassware, hardware, and gold ware is nothing short of what we might see gracing the current Neiman Marcus holiday catalog. I think what amazed me most about ogling the nearly 23 century old crown of delicate gold leaves and armature or the intricate glass filigree surrounding a very antique chalice were that not only were these arts lost for several hundred years during the dark ages, but that also, these were objects of which an artisan dedicated their lives. These artisans were masters of their crafts. Who can tell just how many hours were spent on these crafts. It makes me ponder a bit one of my own ancestors, a silversmith in early 19th century New York (of whom I’ve been amassing a multi-piece collection). Or to pause on the numerous manufacturers and vendors who also make a point to continue the crafts of past eras. Hardware, especially cabinetry hardware, is one of those arts that seem to have fallen by the wayside. Few out there provide designers and homeowners alike with the more detailed hardware of times past. Remember the hinges of Victorian homes? Sigh. It makes me think a bit of DuVerre, a Canadian based hardware company specializing in higher end, artisan designed cabinetry accents, and their dedication to preserving the handiwork of the metalworker. For their many years of operation, they continue to hand finish each of their drawer pulls and door handles. In the case of their Kuba series, designed by well-known spa-designer Clodah, the labor intensive sand casting is the only production technique that can produce the intricate Asian inspired motif gracing its face. But I digress. In the end, it simply reinforces the need to further the arts, the industries, the crafts that one by one disappear. It’s a call to support artisan-crafted pieces. It kinda makes me want to go out in the back yard and whittle some wood. Hardware images courtesy DuVerre, All others copyright DCoopMedia and may not be used without permission. 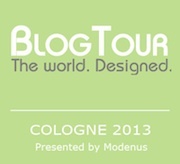 This post is part of the BlogTour Cologne series sponsored, in part, by DuVerre.